For anyone out there that is a grandparent, I could stop writing this post right now. You already know what I am going to say about being a grandparent, don’t you? People have written about the joys of being grandparents since the beginning of time. How it’s a reward, a blessing, or even a great do-over for whatever mistakes we may have made when our own kids were growing up. Given how much we love being grandparents, it’s fair to ask why it is so different the second time around. Sure, it’s partly because of what everyone jokes about. “Let’s spoil them, they are so sweet and adorable. Oh, they are getting fussy, time to send them home to their mommy and daddy to deal with. Let’s feed them candy and ice cream at our house, we don’t do it that often! Let’s have a sleepover and let them stay up late and crawl in bed with us.” Did we ever do that stuff with our own kids? Never! We had to work the next day, and do laundry, and cook and shop and help with homework and on and on and on until it was time to fall into bed, exhausted from all the multi-tasking. I was lucky if there were enough clean clothes for my kids to wear before catching up again over the weekend. When we were young and working at warp speed, we just didn’t have as much freedom and time to play all day long and enjoy all those little special moments we now wish we had back with our own kids. By the time our grandkids come along, our careers are slowing down and those long-held jobs just don’t seem that important to us any more. All the things we worked hard to achieve have been achieved, life might be getting a little boring now and we are stuck in those proverbial ruts. Enter stage left, a little adorable screaming bundle of red and wrinkled skin, eyes tightly closed, all wrapped up in tight pink or blue swaddling and our lives are turned upside down. It’s that second chance we didn’t even realize we would have along the way. We are willing to do anything that will make those little faces light up with joy. 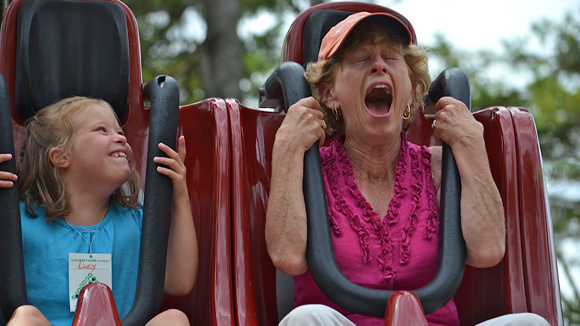 Even if it involves doing things we absolutely hate, like the grandma in the picture. I remember when my kids were young, my mom would spend her summers trying to think up fun things for my son to do while visiting during summer breaks and now we do the same with our little grandkids. Thank heavens they still enjoy taking leisurely rides on narrow gauge trains in the mountains of Colorado. But I know the day is coming and I’ll be up to the challenge of loopy wild rollercoasters, absolutely anything for my 3 year old granddaughter and 5 year old grandson. For those of your that aren’t grandparents yet, just wait. Everything everyone tells you about grandparenthood is absolutely right and even more so. I spent a few months away from my grandkids this summer and when they came running out to greet me, one kind of shy and the other one running full steam ahead, my heart just stopped. It doesn’t get any better than those moments. God gives us so many wonderful gifts throughout our lives, and our children and grandchildren are the most precious and amazing of all.